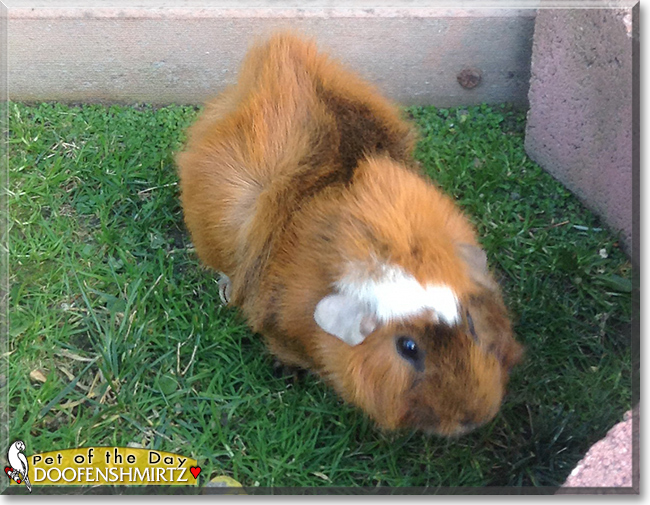 "Doofenshmirtz the Guinea Pig, the Pet of the Day - December 09, 2015"
Doofenshmirtz is a guinea pig who loves to run around! He was named after Dr. Doofenshmirtz from the "Phineas and Ferb" TV show, and we watch the show with him and his brother, Perry, whenever we think they need a break from running around their cage. Around a year ago, when we left for two days for Thanksgiving, leaving them with plenty of food, they got in a fight and Perry attacked Doofenshmirtz's eye. When we got home and realized, we took him to the vet, but he can never see in that eye again. But nevertheless, he is energetic and cute. Doofenshmirtz and Perry are our second guinea pigs, but they are still as loved as our first! Talk about Doofenshmirtz in Pet Talk!